Accused of murdering the baby in her care, seemingly cold and measured nanny Lisa Stewart maintains her innocence. But when she changes her name and tries to run away, the terrifying threats always find her. Is she an innocent victim of public anger? Or a calculating murderer on the run? Can DI Fleming, dogged by her own past, uncover the truth? 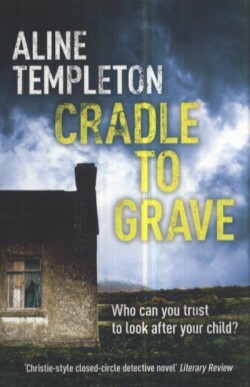 A welcome return for Templeton’s tough but tender DI, Marjory ‘Big Marge’ Fleming… The vivid characterisation, excellent description and a horribly looming sense of inevitability make Cradle to Grave a riveting read. Templeton can always be relied on to provide a well-written, cleverly-plotted, old-fashioned whodunit. A satisfying story with a well-balanced combination of human and criminal problems. Aline Templeton has created a classic whodunit which could easily have been penned by the queen of crime herself, Agatha Christie…. This is an intelligent, character-driven novel, skilfully plotted and well-paced from its leisurely start to its moving and unexpected climax. The village of Radnesfield – ugly, remote and inbred – lurked in the heart of Fen Country, by-passed for centuries, keeping itself to itself and nursing its ancient secrets. So it was with deep unease that its inhabitants discovered that the big house and its land, owned by the Radleys as far back as anyone could remember, had been sold to Neville Fielding, television soap star and anti-hero. But for all their dark suspicions, no one anticipated the storm that would demolish their twilight world. They are well-heeled, comfortable and complacent – or so thinks the newly-Reverend Margaret Moon, disgusted by the materialistic lifestyle of her Thames Valley parishioners. It is only when her brother, a forensic psychologist, comes to stay that she becomes aware of the uneasy currents and tensions which pervade village society. Someone is concealing a childhood trauma so severe that it has fractured her personality. But who is it? Eden Harrington, conductor, impresario, and founder of the Harrington Music Festival, is dead. So is Dominic Leigh, the gifted, wayward trumpet-player – only no one seems to want to talk about that, whereas Eden’s daughter Anna, obsessive about her late father, is determined to keep his memory alive. When Anna announces that she is prepared to sacrifice everything to keep the failing festival going, including the career of Adam Beaumont, the brilliant young conductor who has succeeded her father, there is no shortage of people who have a vested interest in stopping her. Then she is found shot and Adam is arrested for her murder. Penny Beaumont is desperate to prove her husband’s innocence, but has her admiration for his genius blinded her to other, darker sides of his complex character? Penny finds herself haunted by the ghosts of her past – even Detective Sergeant Diane Braithwaite has held a grudge against her since their childhood. And when John Dauncey, a pianist with a world-wide reputation, arrives for his concert in the middle of the investigation, he too finds that past events are casting a long shadow. local community is a daily torment. Then a young nurse is found dead at a nearby beauty-spot, her corpse strewn with wild flowers in some sick and sinister private ceremony.